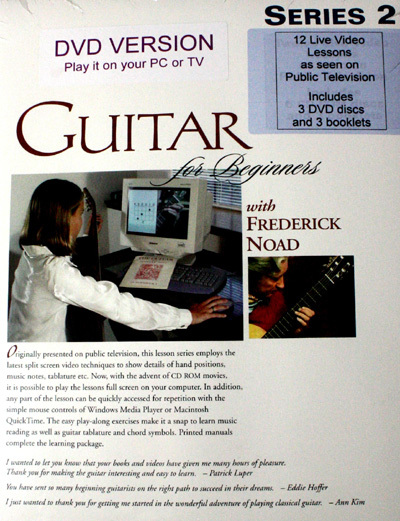 "Frederick Noad's famous GUITAR FOR BEGINNERS series, screened nationally on public television, is now available on DVD. This series consists of 12 lessons on 3 DVD's, (there are 4 lessons per DVD). Lessons are approximately 1/2 hour each. Instructional booklets accompanies each 4 lessons. Lesson 13: More about chords. Silent Night accompaniment. Aura Lee. Lesson 14: Introduction to Greensleeves. How to count dotted notes. Lesson 15: Upward Slur. Flats. Changing position. Notes in the 5th position. Lesson 16: The Descending Slur. Use of the nails. Country Dance. Lesson 17: How to Memorize. 16th notes. 5th position practice. Lesson 18: Rondo by Noad. Tone contrast and Vibrato. Lesson 19: The Half Bar. Introduction to Flamenco. The Rasgueado. Lesson 20: The Sevillana. Flamenco practice. Lesson 21: The Full Bar. Lute music on the guitar. Kemp's Jig. Lesson 22: 5th position practice. Moorish Dance. Etude in B Minor (Sor). Lesson 23: Work on the Sor Etude. 5th position practice. Review. Lesson 24: Self-test, play-through, information for future progress. or in groups of four lessons, see below for their links. Now available, for the first time on CD, Guitar for Beginners Series 1 & 2 exercise and performance piece collection.